Written by alessandro on December 23, 2017 . Posted in All Stories, Curiosity, Itinerary. One of the easiest ways to arrive in Rome, and to us, is by train. Rome is an important train hub in Italy and you can get there from any part of Italy with regional trains. For those who find a bargain or prefer to fly and come to Rome by airplane, here is how to get from the airport to the center of Rome , and to us at B&B Gli Artisti. The quickest way to get to Rome Termini Station from the airport is to take the Leonardo Express train. The Leonardo Express takes only 30 minutes ( non stop) and leaves every 30 minutes from Fiumicino. The only “inconvenience” is the 14,00 euro each way, per person. However, the best thing is that if you are late or you need to be punctual, the train is the best solution for you, given that you won’t find yourself in the middle of the Roman traffic that afflicts Rome, daily. From Fiumicino there is also another train with a final destination of Fara Sabina or Orte, that stops at Roma Trastevere, Roma Ostiense , Roma Tuscolana and Roma Tiburtina, but not Roma Termini This is a local train that takes between 25/­45 minutes to get to your destination. 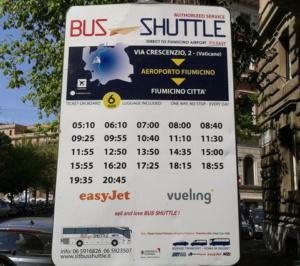 Fixed price of ticket, 8,00 Euro Bus service valid only for Fiumicino is the Shuttle bus that is on Viale Crescenzio, in the Prati area, where B&B Gli Artisti is located. If you come from Fiumicino , this is the cheapest and quickest way to get to us. the cost is only 6,00 euro one way and round trip, 11,00 euro.